Until this year, snakeskin print made me think of Les Battersby in Coronation Street, but it’s become the unlikely print that can’t be restocked fast enough. 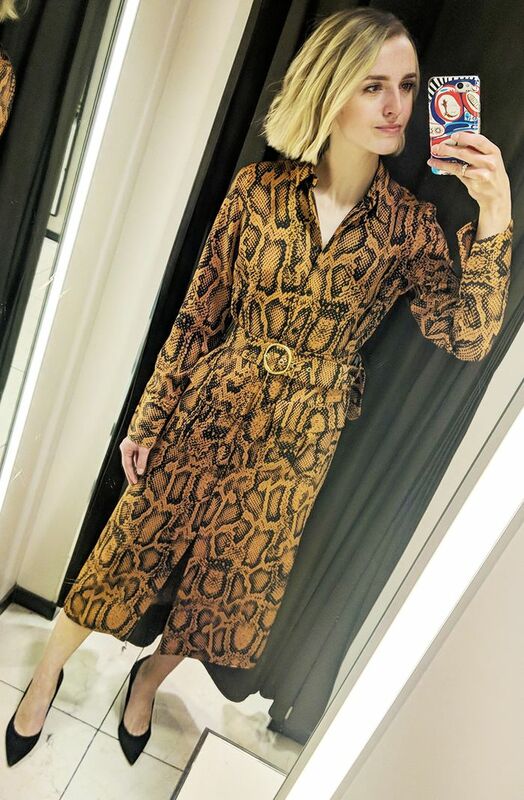 Topshop’s snake shirtdress sold out within less than 24 hours of being restocked and AmazonFashion's Find snake print dress sold out within a few days. These aren't the only high-street store to embrace the python — Zara, New Look and ASOS are all looking rather slithery right now. There’s actually no rule when it comes to the type of snake to go for. Shiny or matte, orange or more grey, there really is every type of snakeskin you could imagine. Animal print is so prolific in 2018 that shopping is like going on a fashion safari— it’s no longer just about leopard, as cow, zebra and snake prints are also having a moment too. And snake isn't quite as out-there as you might think — keep scrolling for some of our favourite python dresses we've seen. Style Notes: Who What Wear UK's Joy wears her snake print Zara dress with black simple courts. Perfect for the upcoming party season. Style Notes: Lisa Aiken's red snake print dress looks amazing with her black chunky boots. Style Notes: Penny Goldstone pairs her Topshop snake maxi with a Danse Lente bucket bag and black leather sliders. Style Notes: ASOS insider Syana wears her £32 snake-print ASOS maxi dress with white Nike trainers and a belt bag. Style Notes: Ikra goes all-out snake, wearing Zara’s tunic and matching trousers. Click to see and shop our edit of the best dresses that are still in stock. Next up, see the eight ways you can wear animal print in 2018.